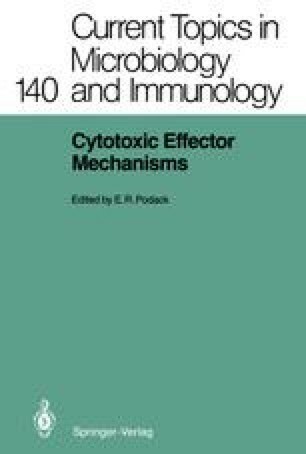 Activated cytotoxic T lymphocytes (CTLs) are presumed to be the effectors in the lysis of virally infected or transformed host cells, the mediators of graft rejection, and the potential culprits in a number of autoimmune diseases. Unfortunately, there is no marker available that specifically identifies these cells in vivo, making it difficult to prove unequivocally that CTLs are the effector cells in these immune functions. Mature T cells are usually divided into subsets on the basis of their surface phenotype: Those that express the CD8 antigen are assumed to be potential cytotoxic cells, and those that express the CD4 antigen, potential helper cells. However, the identification of CD4+CD8- CTLs (Golding et al. 1985) and CD4-CD8+ helper cells (Swain and Panfili 1979) both in vitro and in graft rejection in vivo (Rosenberg et al. 1987) limits the usefulness of this division. A more serious problem with using phenotype to imply function is that these markers are expressed on both active and resting T cells. Thus, they cannot be used to distinguish between the cells participating in a localized immune response and those nonspecifically present at the site. To identify cytotoxic lymphocytes more accurately, we used a molecular genetic approach to isolate genes expressed by these cells.